Irecently asked readers to submit their burning leadership development questions. Those that get picked for a post will receive a free copy of my eBook. As a leader, we're supposed to developing our replacements. When it's time to go, how do we transition gracefully? One of the best books I’ve read on the topic of leadership transition is from Marshall Goldsmith, called Succession, Are You Ready?. 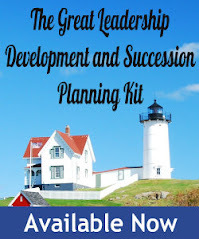 This short, easy to read book is written as a “memo” to CEOs, addressing the emotional and human side of succession planning from their perspective. It’s a personal guide on how to slow down, let go, move on, and how to choose and prepare your replacement(s) – to “pass the baton”. I also wrote a post in back in 2011, as I was transitioning from my last company. As I re-read and reflect back, I don’t think there’s much I would have done differently, other than I wish I would have allowed a little more time to transition out. There’s no shortage of advice, research, processes, and programs that deal with developing and onboarding leaders for new roles. That’s a good thing – getting new leaders ready is critical to the success of any business. That’s one of the primary purposes of this blog. It seems that very little has been written about how leaders should handle exiting their leadership position. Sure, you’ll find plenty lots of advice on resigning from a job, i.e., how to give notice, how to write a resignation letter, how to resign gracefully, etc… but I couldn’t find anything written specifically for leaders on this topic. I believe that there are probably some unique considerations for leaders when it comes to “passing the baton”. The following list of do’s and don’ts is based on my own personal experience, and certainly isn’t exhaustive, so please contribute to the discussion with your own comments. These guidelines are also written with the assumption that the leader is leaving on their own terms, i.e., they found a new opportunity, vs. being let go. 1. Do have at least one internal successor prepared to take over. Unfortunately, way too many leaders neglect this part of their job. It could be an ego thing, or perhaps insecurity. To me, not having prepared at least one successor is a leadership failure. Handing over the reins to someone you trust and believe in should inspire pride and a sense of accomplishment. It’s a way to ensure a continuation of whatever you’ve worked so hard to build. When your employer has to go outside to replace you, chances are, it’s not just because no one on your team is qualified – it’s probably because a change in direction is needed. 2. Do notify your manager first, and provide a formal letter. Then, work with your manager to develop an agreed upon communication plan. For leadership roles, there are organizational considerations, and the higher the role, the more important they become (i.e., investor confidence, customer relationships, etc…). Even for front-line leadership roles, there’s usually a cultural sequence and process for notifications (i.e., direct reports individually notified first, then peer managers, etc..). Once your personal notifications are given, it’s usually up to your manager to take care of the formal organizational announcement. You may want to provide your manager with details (new company, name of position, location, reason for leaving, etc…) to ensure it’s accurate. Not all companies will announce these kinds of details, but it’s better when they do, so it doesn’t sound like one of those “leaving to pursue other opportunities” notifications. 3. Don’t send out mass, impersonal notifications. Think about it…how does it feel when you get an email that’s not addressed to you? It feels like spam. Go through your contact list, and take the time to send a personal note or call those individuals you’ve developed relationships with. 4. Don’t badmouth your current company, job, manager, or co-workers. While this may seem a bit basic, I see it happen all the time at all levels. It’s just not always blatant, but the message is the same – “see ya, losers”. On the other hand, no matter how excited you are about your new role, resist the temptation to gush about it. It comes across as bragging, and again, can cause resentment amongst your co-workers. Save your enthusiasm for your family, friends, and new co-workers. Talk about the good things that you will miss and your confidence in the company’s success. Let people feel good about themselves, while at the same time be happy for you. 5. Do prepare a comprehensive transition list for your manager. 6. Don’t leave your manager a pile of problems that you’ve swept under the rug. It’s about your reputation and legacy after you leave, as well as showing respect for your manager, team, and company that’s been so good to you over the years. Tie up as many loose ends as you can. If there’s a nagging problem you’ve been avoiding, then have the courage and conviction to deal with it before you leave. 7. On the other hand, don’t use your last few weeks to get overly involved in every single thing your team is working on. I’ve seen this happen a lot – maybe it’s some kind of “nesting” urge – exiting leaders all of a sudden micromanaging every aspect of their team’s work. It's about gradually letting go, not pulling in the reins. 8. Do give “sufficient” notice. The common rule of thumb for giving notice is two weeks. However, for leadership roles, there are a lot of “it depends”. Try to negotiate a start and end date that meets the needs of your new and current employer. It’s been my experience three weeks is about right for most leadership roles. Two weeks may put your current employer in a bind. However, if you’ve prepared a successor, a smooth transition plan, and tidied up those loose ends, it may be enough. When it’s anything more than three, you’ll begin to feel like a lame duck. For as much as you’d like to think you’re indispensable, you’ll be surprised how quickly people will begin to move on. Soon, people are going to stop coming to you for decisions, meetings will start dropping off your calendar, and then it’s time to start packing. 9. Do anticipate and respond to people’s individual concerns. Your manager, team, and co-workers will probably have the following reaction: “OMG, really?! Wow, congratulations!” Then, their next thought is usually “OK, so how’s this going to impact ME?” If they don’t come right out and say it, then make it OK to have this conversation. 10. Do take the time to “be in the moment”. Transition can be a special time to reflect on your accomplishments and say goodbye to colleagues, while at the same time feeling the excitement of a new opportunity. When you leave a job, it often causes co-workers to reflect on their own careers and lives. So when someone stops by to say congratulations and/or goodbye, drop what you’re doing and take the time to connect. 11. Do offer to maintain mentoring relationships. I have a network of former managers and employees I still stay in touch with. They are a valuable source of advice, inspiration, and references. While your employees and mentees may not be interested, at least make the offer, and then be there if they do reach out to you. Leadership is about making a difference in people’s lives, and it doesn’t stop when you change jobs. 12. Don’t use this opportunity as “truth serum”. This is not the time to tell people what you really think of them, what they’ve done that’s always bugged you, or leave them with a list of flaws they really need to work on. Sure, it’s OK to keep doing your job as a leader- giving feedback, coaching, addressing performance issues – just don’t do it any differently than you normally would. 13. Don’t work on your new job on your current employer’s dime. 14. Do everything you can do to set your team members up for success. Ask them “what can I do for you before, and even after I leave?” (see #7) Then, follow-up if you can. 15. Don’t give too much advice to your successor. If there is crossover from when you leave and your successor starts, sure, it’s nice to want to set them up for success while you are handing over the torch. Just remember, there’s a time to let go of the torch, and recognize that you’re successor will have their own ideas on how to do the job.